Relations between Microsoft and Google heated up over the past week when Microsoft filed a formal complaint with the European Commission against Google for violating antitrust laws; calling Google an “abusive monopolist.” Microsoft, however, had an unexpected ally; Samuel Miller, a prosecutor who, over a decade ago, filed a similar antitrust case against Microsoft. The United States v. Microsoft case, brought in in the early 90’s and ending in 2001 was the case in which Miller stood as a lead counsel. The case ended with a constraint of Microsoft’s business practices in a consent decree. It is a greatly ironic event, as Microsoft, after being told off in 2001, is now filing against Google for the same thing. Microsoft’s Chief Legal Counsel Brad Smith has even posted in a long blog post the areas in which Google has impeded its competition. Google is a giant. It has its own browser, a massive search engine, and multiple exclusive agreements to websites for powering their search engines. Not only those, but Google has been charged for two other antitrust violating acts: hoarding Microsoft AdWords data and even abusing its YouTube ownership. Microsoft claims that Google breaks antitrust laws because its ad platform data lacks the interoperability with Microsoft’s. This point got more attention by the experts. 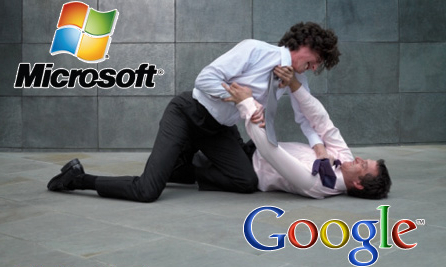 Both Microsoft and Google compete in an online advertising market, and Microsoft claims Google prevents advertisers from implementing their ad campaigns in other competing platforms such as Microsoft adCenter. The process Google goes through to export their data and import it to adCenter is difficult, but in the most sense possible. Andrew Frank, a Gartner analyst, made a point that “Microsoft’s claim is belied by a number of third party platforms that support multiple ad platforms.” Not only that, but Frank says that Microsoft’s point that “this data belongs to the advertisers” is a doubtful statement, seeing as advertisers sign over their data to Google, entering standard legal agreements. The argument was ignored as an expert noted it as Microsoft’s least convincing argument. Microsoft makes its’ largest and most valid argument with Google’s exploitation of its YouTube ownership; claiming that Google has put up technical blocks that prevent Bing from properly finding YouTube videos, causing for lesser video search results. Therefore, Google has better YouTube results. Hausfeld thinks that the European Commission might simply encourage both companies to end their exclusivity agreements, without ruling one way or the other.